Click here to download this page in PDF format. 12 tube case of ASI 502 Silicon Sealant. The new ASI 502 Translucent Silicone Sealant / Adhesive is excellent for kitchen or bath tile sealing. The translucent silicone blends with natural colors to create a beautiful & professional appearance. Acetoxly cure has natural antibacterial properties making it perfect for kitchen and bath areas. Fully cured, ASI 502 has excellent adhesion to glass, metal, porcelain, ceramic, wood, most plastics and many other nonporous substrates. ASI 502 is considered very easy to work with. 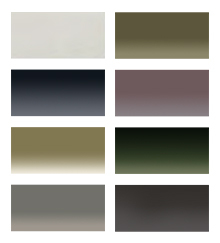 It works on a variety of substrates and has 8 beautiful colors to choose from: trans white, trans beige, trans earth, trans green, trans blue, trans gray, trans rose, and trans charcoal. Please remember to specify your color from the drop down menu before adding the product to your cart. Available ASI 502 Translucent Colors, from left to right: Trans White, Trans Earth, Trans Blue, Trans Rose, Trans Beige, Trans Green, Trans Gray, Trans Charcoal. ASI 502 is an excellent sealant for many industrial applications where a long-term, permanently flexible bond or seal is required. Such applications include kitchen and bathrooms, trucks and trailers, skylights, aquariums, and more. General sealing for other purposes such as food service installations, walk-in refrigerators, trailers, engine components, seal and waterproof, coaxial cable connectors, weatherize switch parts and instrument mountings are appropriate. Each job will require the following tools. The ASI 502 caulk comes with an attachable nozzle, therefore you do not need to purchase a nozzle. But the Hook Shaped Caulk Tube is excellent for hard to reach areas like behind a sink or faucet. 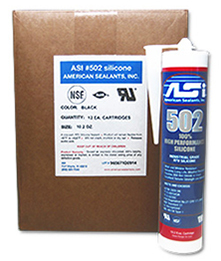 The ASI 502 tube must be placed into a caulk gun to dispense the contents. Most any will do. The professional grade Newborn 250 Caulk Gun is popular. An old putty knife can be used to remove the old grout. An old putty knife or utility knife or such can be used to remove old grout or caulk. tly finished caulk joint. Scotch 2090 painter's masking tape. Scotch 2090 painter's masking tape is preferred to mask off and creat clean straight caulk lines. Its easy to remove, has no residue, and makes for faster clean-up. Additionally a professional caulking tool can be used instead of a putty knife to achieve an even cleaner joint finish. A Caulk Joint Finish Spatula tool is used by kitchen and bath professionals all over the United States. Below are the recommended steps for achieving a professionally caulked joint. Gather all tools and prepare the surface as described below. Prepare the area by cleaning the surface of any grease, debris or dirt. Use a putty knife then a utility razor blade to remove the old grout or sealant. After removal, clean again to insure that all residue and dirt are removed. 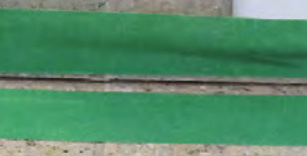 Apply the painter's tape to create a clean joint. Apply tape to the joint edges where the sealant should NOT appear. This will ensure a nice even finished edge. Painters tape is recommended as it has no residue. Use a Caulk Joint Spatula to smooth the joint. First, insert the tube of ASI 502 into the caulk gun. Squeeze the trigger of the gun until the tube is locked firmly into the gun. Apply the sealant to the area by using a caulking gun. Fill in the gap with an even bead of sealant for an even finish. Use the caulk joint finishing spatula to even the bead. Finished product should be left alone to cure overnight. Remove the masking or painter's tape. At this point, if necessary, you may retool the surface to even out the caulk. Allow the caulk to cure over night before using or touching the surface. same day shipping on most orders placed by 1pm MST.